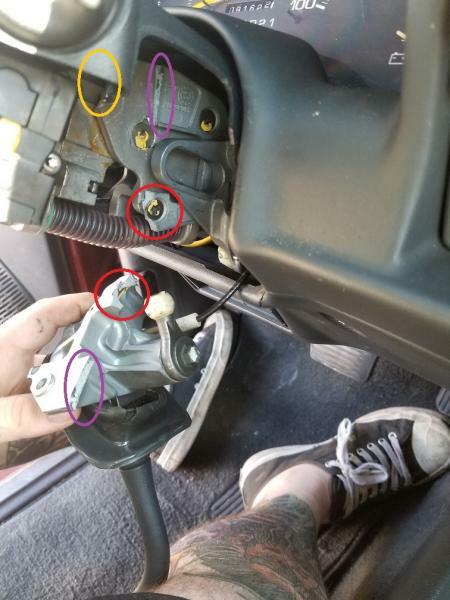 Column shift disintegrated on my GFs 1995 Blazer. We bought this a couple months ago at 91k miles, shifter felt a little wonky, now I know why. I've never seen this type of failure before. You can see the metal has sheared right at the two mounting points. What year columns can I swap parts from? just 95? 95-97? newer? Also I can force what's left in there to go into P R N and D, anyone see any problem driving it 170 miles back home with the shifter fubared so I can work on it in my garage instead of the street with minimal tools? Scott Burch off the S10 Addictions and S10 Friends facebook groups helped me out and is shipping me some replacement parts. I'll try post some pictures to make a how to of the repair. He said it actually is a common issue. If you need any steering column parts or assistance, I suggest reaching out to him on Facebook.